Mahan Air Airbus A300B4-600 lands at Birmingham International Airport, England. Credit: Adrian Pingstone/Wikimedia Commons. 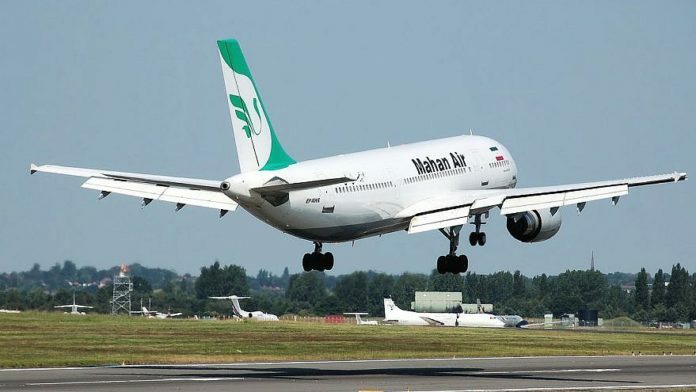 (January 21, 2019 / JNS) Germany has banned Iranian airline Mahan Air from its airports, media reported on Monday, in accordance with recent sanctions enacted by the European Union against Iran in response attacks on opponents in the bloc. “The Federal Aviation Office (LBA) will this week suspend the operating license of Iranian airline Mahan,” reported Munich-based daily Sueddeutsche Zeitung. Iran’s second-largest carrier after Iran Air, Mahan flies four services weekly between Tehran and the German cities Duesseldorf and Munich. The United States imposed sanctions in 2011 on Mahan Air—established in 1992 as Iran’s first private airline—claiming that it provided financial and other assistance to Iranian Revolutionary Guard Corps. The United States has also sanctioned those who align with the airline such as Malaysian-based Mahan Travel, Tourism Sdn Bhd and Thailand-basedMy Aviation Company Limited. “The U.S. welcomes #Germany’s decision to deny landing rights to #Iran’s Mahan Air. The airline transports weapons and fighters across the Middle East, supporting the Iranian regime’s destructive ambitions around the region. We encourage all our allies to follow suit,” tweeted U.S. Secretary of State Mike Pompeo. The U.S. welcomes #Germany’s decision to deny landing rights to #Iran’s Mahan Air. The airline transports weapons and fighters across the Middle East, supporting the Iranian regime’s destructive ambitions around the region. We encourage all our allies to follow suit. “We fully support the action today by Germany to counter Iranian-sponsored terrorism in Europe by banning Mahan Air flights. Mahan Air exploits commercial air to support Iranian terrorism by transporting operatives, weapons, and funds throughout the Middle East and beyond,” tweeted U.S. National Security Advisor John Bolton. We fully support the action today by Germany to counter Iranian-sponsored terrorism in Europe by banning Mahan Air flights. Mahan Air exploits commercial air to support Iranian terrorism by transporting operatives, weapons, and funds throughout the Middle East and beyond. Monday’s development comes as the European Union has separated itself from a U.S.-led summit in Poland on Iran next month, as it the continental bloc agreed on a new body to circumvent U.S. sanctions on the regime, although European countries have been planning punishments against the Islamic Republic. Earlier this month, the E.U. sanctioned an Iranian intelligence unit and a few members of its staff, as Holland accused Iran of two murders in 2015 and 2017 on Dutch soil, joining Denmark and France, which have alleged that the regime planned other attacks last year in Europe. Additionally, asset freezes and travel bans were assessed against five Syrians tied to Syrian President Bashar Assad’s chemical-weapons program. The E.U. also sanctioned the Scientific Studies and Research Centre, which has allegedly assisted in the Syrian government’s use of chemical weapons against its citizens.